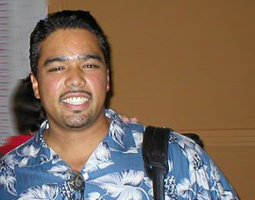 Rodney Morris was born on the 25th of November 1970 in Anaheim, California, but raised in fact in Hawaii. However, today this fine 9 ball player lives in Houston, Texas. Rodney began playing pool at the relatively late age of 17 and very soon wanted to see how far his talent would take him so he left Hawaii in 1988 to travel round the USA gaining experience playing anyone he could in order to hone his skills. Morris really made his first great impact on the world of 9 ball in 1996 when he beat his idol Efren 'the magician' Reyes in the final of the U.S. Open and this of course cemented his place on the professional circuit. After taking a break from pool between 1997 and 2001, Morris came back to win his first tournament at the Reno Open proving that he had lost nothing of his skill during the break. In 2003, Morris was invited to represent team USA in the Mosconi cup for the first time and was undefeated in singles play. The following year in the same tournament he was named most valuable player. Around this time he gained the nickname 'The Rocket' As a member of the International Pool Tour (IPT), in the summer of 2006 he was close runner-up to Efren Reyes in the inaugural IPT World 8 ball Championship which was held in Reno, Nevada. Reyes earned $500K for first place, Morris won $150K for second. Rodney Morris' temperament could best be described as smooth and easy going and he usually has a smile on his face. When he is on form he looks effortless at the 9 ball pool table.